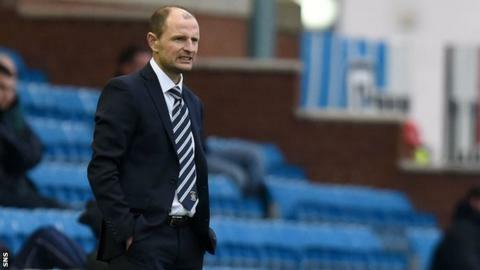 Allan Johnston was left deflated after his Kilmarnock side failed to close the gap on a top six place following a 2-2 draw at home to Partick Thistle. The home side recovered from Ryan Stevenson's early goal to lead with 11 minutes left after Josh Magennis and Manuel Pascali hit the net. However, Frederic Frans rescued a point for the visitors when he directed the ball past Craig Samson five minutes later. "The boys deserved more than that," Johnston told BBC Scotland. "They gave everything right to the final whistle and they're absolutely gutted they never got the three points. "There was a lot of good individual performances today. I thought Rory McKenzie was fantastic but as a team I thought we played a lot better. "You saw the fans get right behind the team today, I thought the fans were fantastic. It was a really good atmosphere. "We're trying to get in the top six, that's the aim, but we need to win games like this." Partick Thistle defender Frederic Frans celebrates his late equaliser. Partick Thistle manager Alan Archibald was in more buoyant mood despite his side not managing to follow the midweek win over Hamilton with another victory. He said: "We continued from the other night's performance in the first 15 to 20 minutes causing them all sorts of problems, got the goal, and had another couple of good chances but never took them. "To be fair to Kilmarnock they came right back into it. "Kilmarnock are a hard team to play against down here. They're really physical and they get the ball forward early. It was great desire from the team to get back in the game and get the point. "Our squad has been stretched to the bare bones, we're just starting to get guys back. "We're looking up [the table] because Kilmarnock are still in touching distance. "That's the positive thing about today - we get the goal, it gets a point on the team below us and also Kilmarnock are still there to grab."